POD3 is based on findings from four years of the Preventing Obesity by Design (POD, 2007-2011) indicating increased OLE-supported physical activity after renovation, the current Shape NC project (2010-present), the DCDEE initiative “Creating a Supportive Network” (2011), and findings by others showing a) young children learn most through hands-on experience, and b) being outdoors is critical to children’s physical development, activity, and healthy nutrition. Thus, the outdoor environment in childcare centers is related to learning in all developmental areas and supports holistic childhood experience centered on healthy living practices. Offering seed grants to POD3 Lab sites and incentives for Technical Assistant providers and community college instructors. 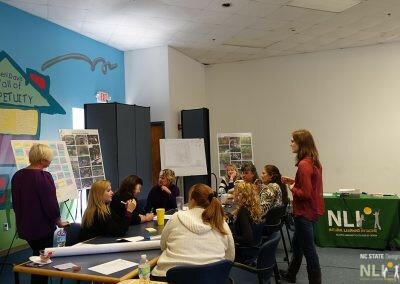 The Natural Learning Initiative hosted the first ever Inter-Institutional Outdoor Learning Environment (OLE) Design Charrette on January 30, 2013. This historic event included a professor from each program and a total of 29 landscape architecture and horticulture students spanning the three institutions of higher education. NLI staff gave presentations, facilitated the charrette activities, and actively mentored each of the eight student design teams. NLI instructional staff included Robin Moore, Nilda Cosco, Jesse Turner, Julie Murphy, Brad Beiber, and Sarah Konradi. Gene Bressler greets students with Robin Moore. 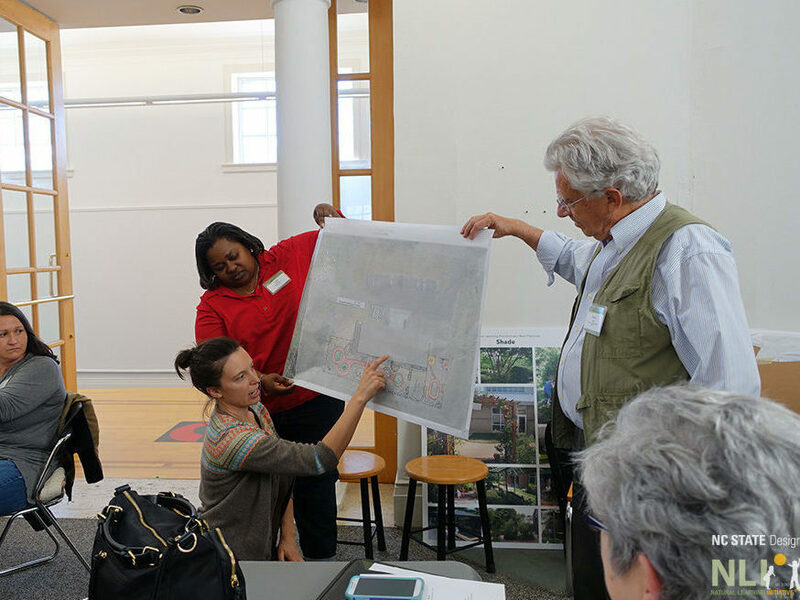 The purpose of the charrette was twofold, 1) to expose prospective landscape design professionals to early childhood OLE design best practices; and 2) to foster greater connections between these three departments and institutions. 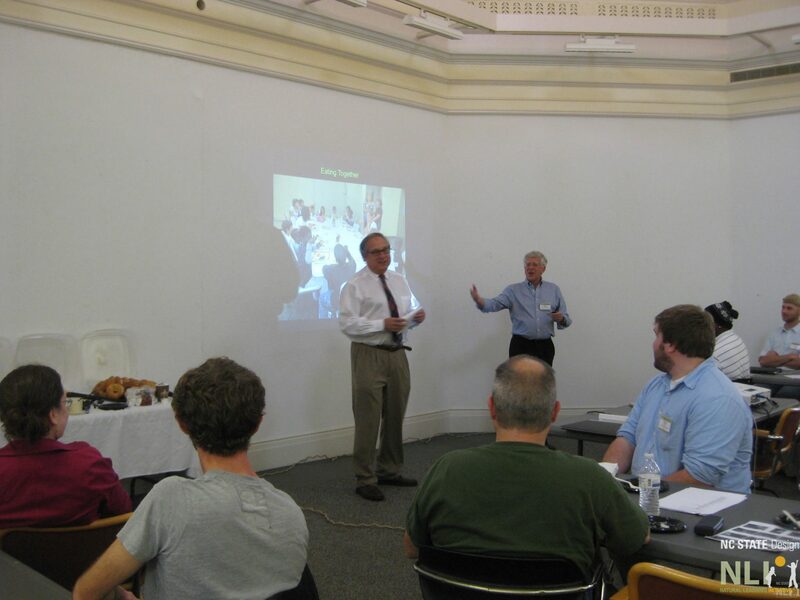 The event marked the beginning of NLI’s effort to develop various OLE education modules for use in landscape architecture, landscape design and horticultural technologies programs across the North Carolina community college and university systems. This component of NLI's current POD3 Project, which is funded through the generous support of the Blue Cross and Blue Shield of North Carolina Foundation. The most valuable aspect of the POD3 charrette was networking between colleges and working with different designers on different levels, and hopefully meeting future colleagues and professors!!!!!!! I found the charrette session to be a good teamwork exercise as well as a wonderful exercise to make people come out of their comfort zone & work with people they have never met before. We were able to put all perspectives into the designs instead of just what we have learned at the Community College Level. Designing with children in mind is rewarding as well as challenging....it is tough to try to think like a child, but enhances one's creativity and awareness. Also, working with small spaces with many demands for usable space forces one to design for multi-purpose functional spaces that are intriguing to a variety of age groups. Collaborating with other students from different schools offers a new way of designing. Children and obesity is becoming a major concern in our society more than people believe it is. Approaching a design problem with various concepts may help the engagement and encouragement of new concepts for designs. Published in the American Journal of Health Promotion (Vol. 28, No. 3) this article By Nilda Cosco, Robin Moore, and William R. Smith, shows that site layout attributes are associated with higher levels of physical activity in the childcare setting, while teacher interaction is associated with a decreased level of physical activity in children. Purpose: To evaluate the effectiveness of Preventing Obesity by Design (POD), a childcare center outdoor renovation intervention. Setting: 27 North Carolina licensed childcare centers. 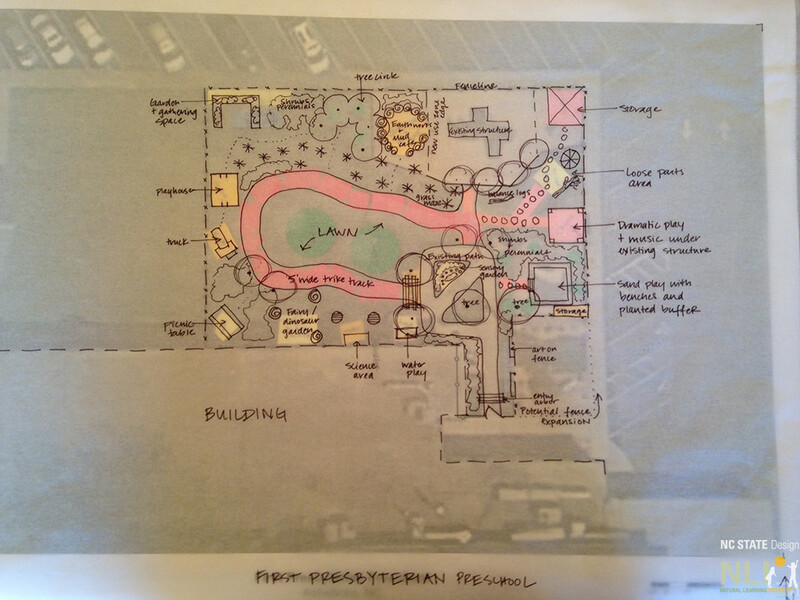 Intervention: Outdoor renovation, teacher training. Measures: Behavior mapping, Preschool Outdoor Environment Measurement Scale (POEMS), center director interview. Descriptive statistics, ordinary least squares and logistic regressions calculated to assess levels of association between environmental change, children's physical activity (PA), social behaviors, and environmental quality. Qualitative interview data analyzed to help understand intervention impact. Results: Behavior mapping showed that site layout attributes, such as the form (i.e., "single loop" and "double loop") of pathways (functioning as circulation routes and wheeled toy settings), are associated with higher levels of PA. Teacher interaction was associated with decreased children's PA. Absence of teacher or lack of child/child interaction was associated with increased PA. POEMS assessment of environmental quality was higher after renovation. POEMS domains (Physical Space and Teacher/Caregiver Roles) were positively associated with PA. After renovation, 68% of center directors reported positive changes in children's behavior and 40% mentioned edible plant installations as greatest success. Conclusion: Built environment renovation of childcare center outdoors, including looped pathways installation, coupled with teacher training, may support increased PA. Renovation, including food gardens, may be a key to success for preschool health promotion and support change in childcare policy. 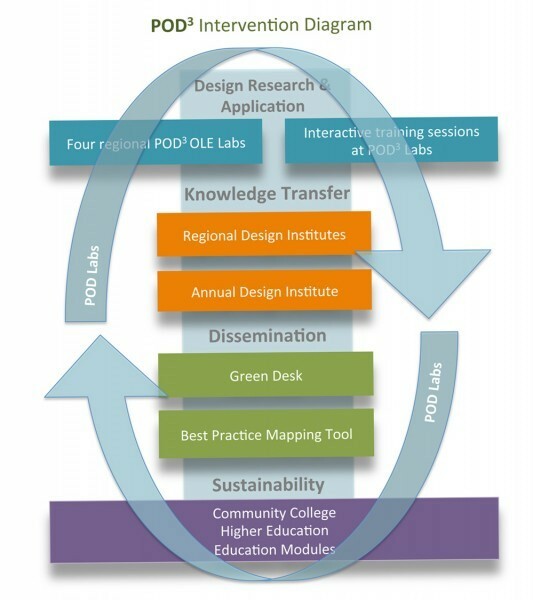 The POD3 Higher Education Modules have been created to assist in developing a network of aspiring professionals who will satisfy the demands of emerging and evolving interdisciplinary approaches committed to supporting healthy human development across the entire lifespan through the design of outdoor environments that promote physical activity and wellness. 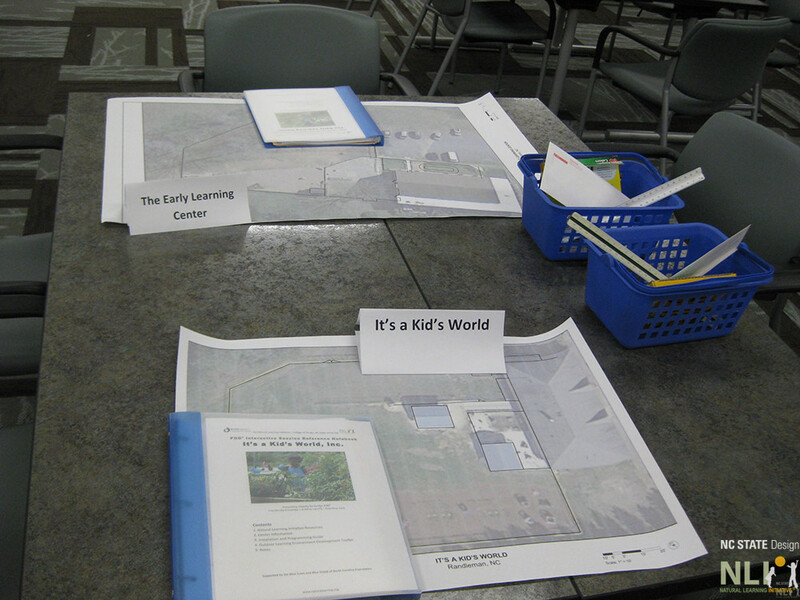 The focus for the POD3 modules is connecting children with meaningful experiences in the natural world through outdoor learning environment best practices. Demonstrate advocacy skills related to outdoor learning in the development of children. 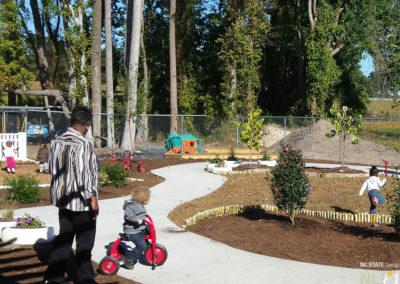 Highlight the importance of designing, managing, and maintaining outdoor learning environments (OLEs) that support intergenerational health, safety, and welfare. 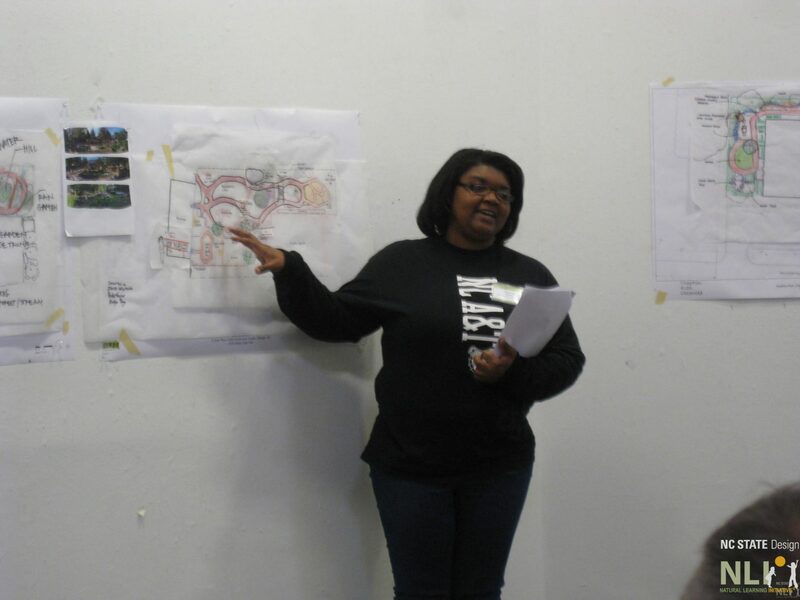 From 2013-2015 through a series of 10 Interactive Design Sessions and 10 Regional Symposia, POD3 worked to make "best-practices" = "common practices" among early childhood, landscape design, and culinary arts students and professionals. 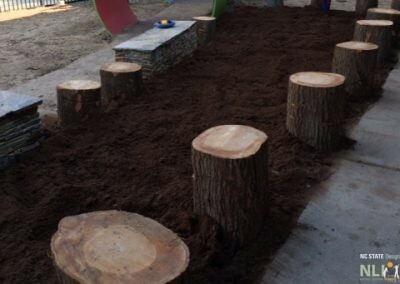 I know that the playground should be a natural fun experience for children, this workshop gave the how and the what to making this happen. Interactive Design Session materials for each participating center. Childcare staff and NLI staff present preliminary plan to fellow participants. Paper flower pot hands-on activity led by regional OLE expert. 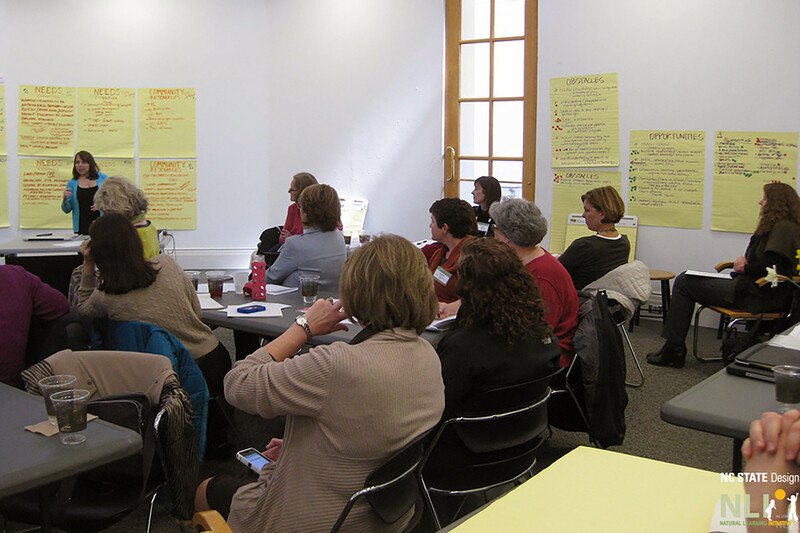 Through POD3, NLI hosted 10 Interactive Design Sessions. Each of these 1 day training sessions hosted to up to 10 childcare centers, with each center bringing at least 2 staff members. Additional regional support staff attended these sessions as well. The NLI design team is comprised of College of Design faculty, licensed landscape architects, and recent Collge of Design graduates and students experienced in designing outdoor environments conducive to health, learning, and well-being for young children. The collaborative approach to design practiced at the Interactive Design Sessions helps engage the early childhood professionals who will be responsible for these renovated OLEs. 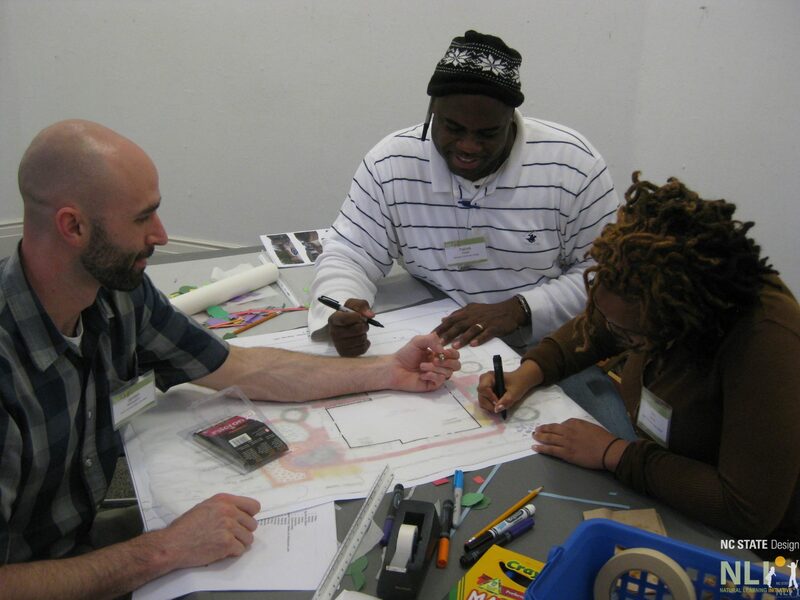 POD3's Interactive Design Sessions provide an opportunity for more childcare centers to take advantage of the NLI design team's expertise in the childcare outdoor environment. 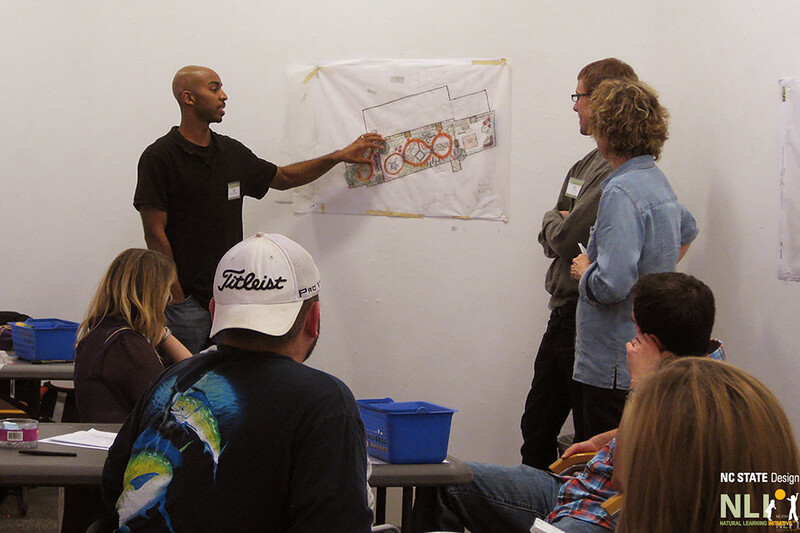 These research-based and hands-on design trainings provide site specific suggestions and details for each participating center, as well as a sketch of the recommendations for their OLE. At the end of the day, each center leaves with a well-formed idea and visual suggestions for how to renovate their OLEs. Childcare professionals (214) serving 7,326 children in 86 centers located in 29 counties received intensive, interactive training, including a baseline outdoor learning environment (OLE) assessment for their center and a design layout created by NLI design staff. 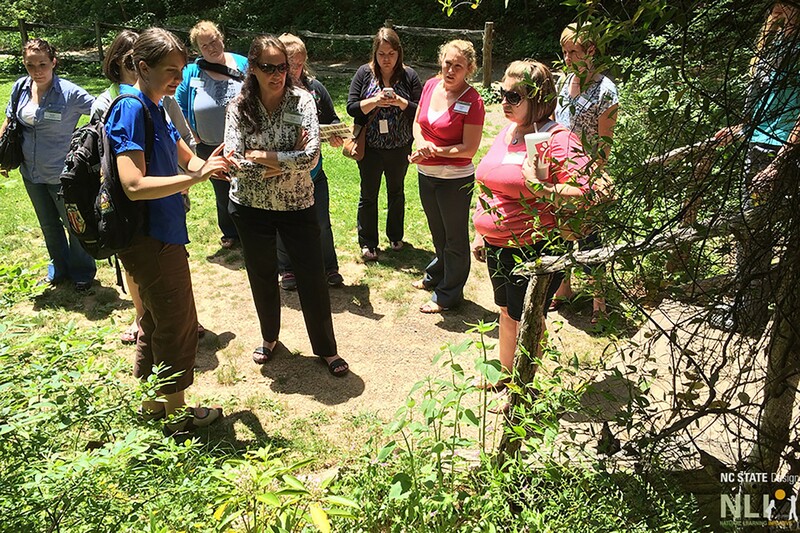 Over 3 years, 10 POD3 Regional Symposia offered an introduction to the benefits of enhancing and naturalizing the outdoor environment for young children to participants from across North Carolina. 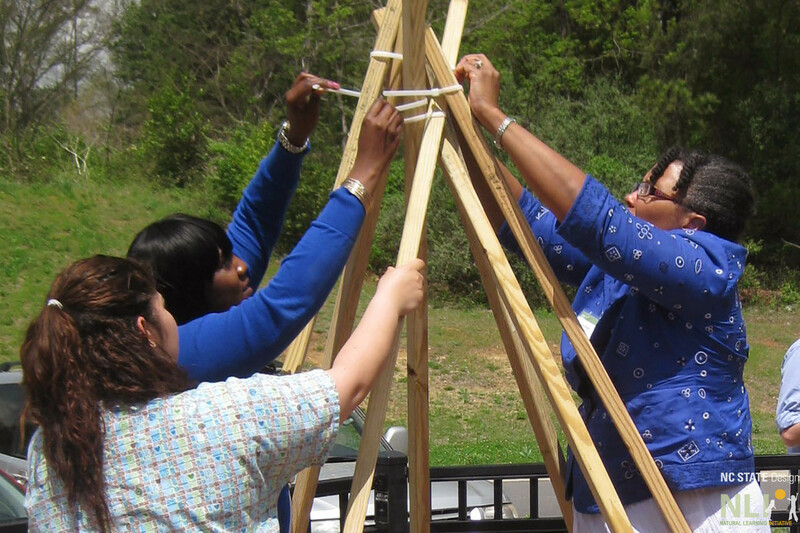 Plenary presentations combined with hands-on activities and tours of model childcare centers in a one day format gave these trainings a similar format to the statewide, 2-day, Annual Design Institute. Through the Regional Symposia POD3 reached early childhood, landscape, community college, and other professionals close to where they work and live. By traveling to different regions the NLI staff was able to reach more individuals at a lower cost. 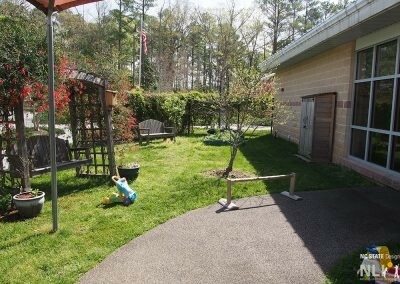 Also the opportunity to visit demonstration childcare centers close to home connects professionals to each other, providing inspiration and know-how for outdoor learning environment improvements. 814 childcare and landscape professionals serving more than 15,414 children from 60 counties enhanced their skills and networked at the POD3 regional Symposia.